Welding | HANAKOV, spol. s r.o. Welding – HANAKOV, spol. s r.o. One of the major, rapidly developing parts of the HANAKOV company’s production scheme is manufacture of sophisticated welded structures and special welded parts according to the customer’s individual demands. We weld and deliver custom-made parts for various industries. The manufacture is ensured by a team of competent welders with state certificates and many years of experience. We meet extensive demand for welding of steel materials of various kinds, including stainless steel, etc. further production by customers’ demands. 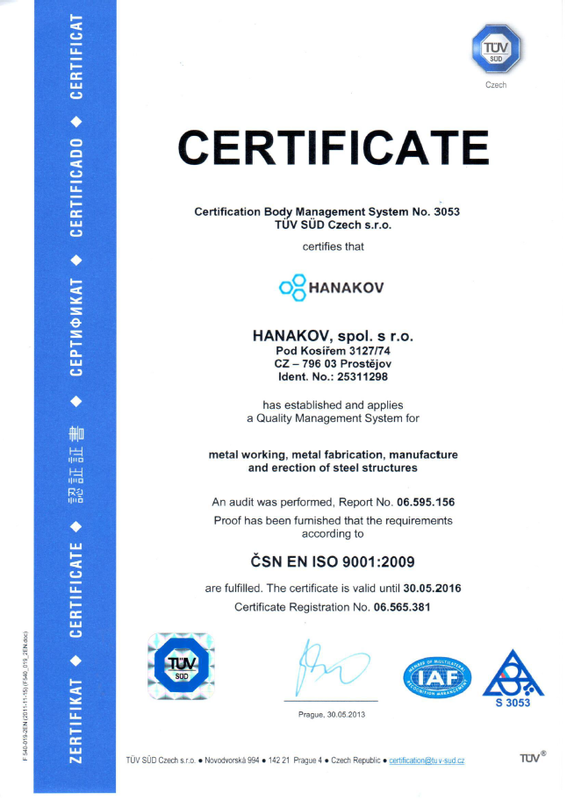 The EN 1090-1 certification attests the introduction of the quality system within the entire process of welding production, thanks to which we a competitive company on both home and foreign markets. The high welding quality is also guaranteed by an independent accredited certification body providing for welding inspection to ensure the system and optimize the manufacturing quality. In case you are interested in our welding shop production capabilities, please contact us via the contact form or contact the Sales Department. We will prepare an individual solution of manufacturing and price quotation when we receive your inquiry.